Micki Mayer, a professional ballroom dance instructor, had started her own business designing and creating apparel for dancing, skating, and aerobics. She needed identity that would reflect the specialized apparel she created. 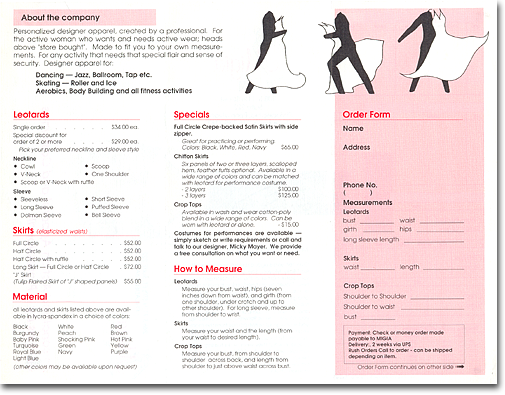 A natural solution was to use line images of Micki's signature creation, dance apparel, in the logo. But, I wanted to give the images a sense of action. So, I drew the apparel as if the dancers were in them. Then, I superimposed "Migia" over the line drawings. 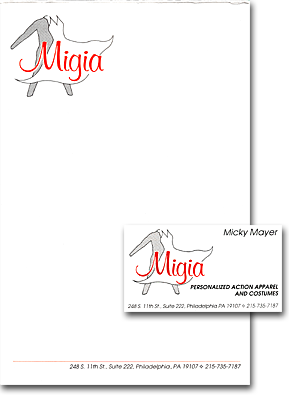 The apparel line drawings became a natural vehicle for extending the Migia brand. In the brochure, they appeared in two additional poses.